Much loved Swede Magnus Olsson, 64, one of the greatest sportsmen in the world of sailing and one of the coaches and mentors for the Volvo Ocean Race's Team SCA, has passed away at a hospital in Spain. His family and friends were by his side.Magnus suffered a stroke during the week and, despite initial positive signs, deteriorated over the following days. Jan Johansson, President and CEO of SCA commented: “Magnus was a great sportsman who, throughout his impressive offshore racing career, brought his passionate spirit and enthusiasm to the sport. He has inspired our female crew, many other sailors, both young and old, and all of us who had the opportunity of meeting and knowing him. Magnus will be deeply missed around the world. Our thoughts now go to his family and all who were touched by his energy and passionate spirit." 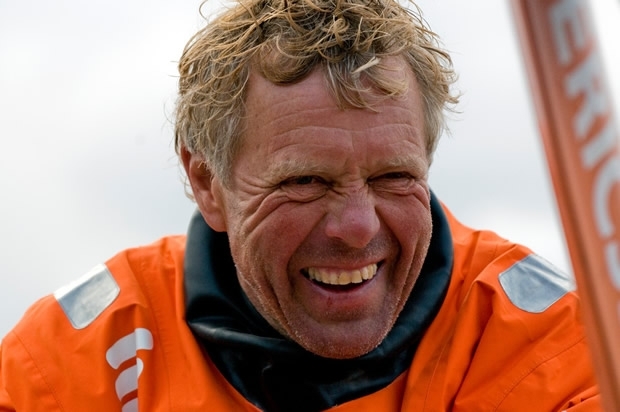 Knut Frostad, CEO Volvo Ocean Race added: "It's with great sadness I received the news about Magnus passing away today. He was my mentor when I sailed around the world with him 20 years ago, he was the inspiration for me and for so many more and more than anything he was the smile of the race. A true friend has left on his final leg and the sailing world will never be the same without Magnus and his smile. Never. My thoughts are with his two sons and his close family today." The blond-haired Swede was renowned for his cheery and up-beat attitude as well as his sailing skills since he first raced in the Whitbread Round the World Race alongside rockstar Simon Le Bon aboard Drum in 1985-86. Has been involved with the leading round the world race campaigns originating from Sweden ever since sailing with fellow Drum crewman/doctor turned skipper, Roger Nilsson, on the maxi-ketch The Card in 1989-90, continuing on with Nilsson aboard Intrum Justitia four years later and staying on as Nilsson was replaced by Lawrie Smith at the end of the first leg. With Smith moving to Silk Cut for the 1997-8 race, Olssen was watch leader on Paul Cayard winning EF Language, the campaign again managed out of Sweden. They approached the 2001-2 race with another strong campaign in Assa Abloy, but they were unable to beat the dominant illbruck crew led by John Kostecki. Olsson's final appearance in the Volvo Ocean Race saw him take the role of skipper for the first time, something he always said he never wanted, after fellow Swede Anders Lewander was forced to step down from the leadership of Ericsson 3 mid-campaign in the 2008-9 race. Olsson and his team were very much the junior partner in a two-boat campaign and eventually finished fourth, with Torben Grael taking overall victory in Ericsson 4. There were still great moments, however, including one that was to rank among the finest of his career. That was on Leg 5 from Qingdao to Rio and it saw Olsson's daring young navigator Aksel Magdahl pull off a huge tactical coup that took the team to a victory that was utterly unexpected – but entirely in line with Olsson's fearless reputation.